In this photograph from 2015, a protestor stands alogside a burning car in Bujumbura, Burundi. Disputed elections that year led to demonstrations and clashes. Since then thousands in the country remain displaced and many forced into refuge outside its borders. Expressing deep concern over the slow pace of the inter-Burundian dialogue and the lack of engagement by the Government, the United Nations Security Council called on all stakeholders, in particular the authorities to commit to the dialogue and reach an agreement ahead of the 2020 elections. 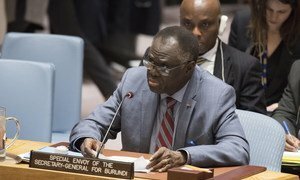 “Dialogue is the only viable process for a sustainable political settlement in Burundi,” underscored the Security Council in a statement read-out by its President at a formal meeting Thursday afternoon. In the statement, the Council also “strongly” condemned human rights violations committed in the country, including extrajudicial killings, sexual violence, arbitrary arrests and detentions, forced disappearance, torture and harassment and intimidation of human rights defenders and journalists. The Security Council also reiterated its “regret” at the Government’s decision to suspend all cooperation and collaboration with the Office of the UN High Commission for Human Rights (OHCHR) and called for a swift solution through dialogue between the UN human rights arm and Burundi in order to enable OHCHR to fully resume its mandated activities, including its monitoring and reporting functions. Also in the statement, the 15-member Council voiced concerns over the continued worsening of the humanitarian situation in the country and, in the context of Burundians seeking refuge in neighbouring countries, called on those Governments to ensure that the return of the refugees is voluntary, based on informed decisions and in safety and dignity. According to estimates, some 180,000 people remain displaced within Burundi and more than 429,000 have sought refuge across its borders. Following the July 2015 election in which Burundian President Pierre Nkurunziza won a disputed third term, violence broke out among state forces, suspected opposition members, and civilians. Urgent efforts are needed to keep the “hard-won” gains in Burundi from eroding, a senior United Nations official told the Security Council on Monday, noting that while the security situation is calm, there is still the potential for volatility as political tensions persist.